Warm up with a hot bourbon cocktail that includes the sweet taste of cinnamon. The hot cinn apple toddy is one of the many hot toddies that you can enjoy on chilly nights and it's incredibly easy to mix up. This recipe starts with an hot apple toddy base, a brew of steaming apple cider spiked with whiskey. Bourbon is the whiskey of choice here and the drink is sweetened with a hint of agave nectar. The key ingredient is the cinnamon schnapps, which gives the drink a deliciously sweet, warm spice. It's a wonderfully comforting cocktail and a perfect way to relax on a cold autumn or winter night. Warm up the apple cider on the stove or in the microwave. Pour the bourbon, schnapps, and lemon juice into an Irish coffee glass or mug. Garnish with an apple or a cinnamon stick, or both. Adjust the lemon juice and agave nectar to suit your taste. For some whiskey and schnapps combinations, you may need just a splash of lemon juice or a squeeze of nectar. Originally, this recipe used Hiram Walker Original Cinn Schnapps, which takes on the sweet taste of a cinnamon roll and it is utterly delicious. However, it's no longer readily available. Goldshläger is the best substitute, though any cinnamon schnapps will do just fine. While bourbon is recommended, any style of whiskey will work in this toddy. If you prefer the smooth blends of a Canadian whisky or an Irish whiskey, pour one of those. To give the drink a nice spice, try rye whiskey instead. For the apple garnish, dip slices into a little lemon juice right after cutting to prevent them from turning brown due to oxidation. You can either cut a small slit in the slice in order to rest it on the rim of your mug or simply let it float on top of the drink. Dress up your hot cinn apple toddy with a slice of green apple dipped in hot caramel. You can also add a dollop of whipped cream like you would a mug of hot chocolate. Honey makes a good sweetener alternative if you don't have agave nectar. 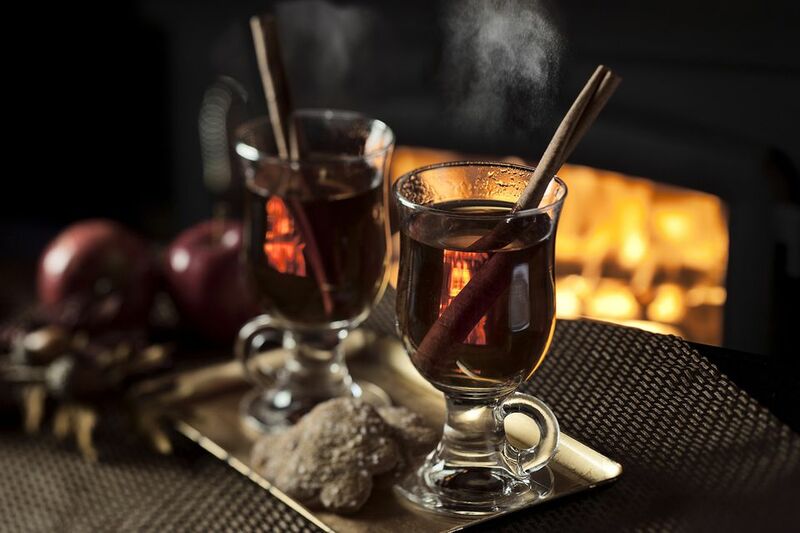 Bring more spice into the toddy by adding mulling spices like cinnamon, nutmeg, allspice, and cloves to your cider while warming it up. Make a nonalcoholic version of this toddy by skipping the whiskey and using cinnamon syrup instead of schnapps. This recipe is easy to transform into a big-batch cocktail for parties. Simply multiply all of the ingredients for the number of servings you need and warm them up together. Use a large pot on the stove and gently warm it over low heat or place everything in a slow cooker. Your house will smell amazing! How Strong Is a Hot Cinn Apple Toddy? The hot cinn apple tidy is a gentle, low-proof cocktail. When made with 80-proof whiskey and 60-proof schnapps, it has an alcohol content right around 9 percent ABV (18 proof), making it lighter than the average glass of wine.